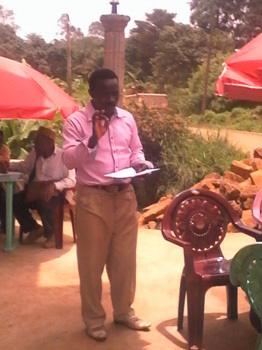 During the regular monthly routine meeting of NOWEPIFAC group delegates for the month of June that took place at the NOWEPIFAC head office in Bamenda on Wednesday 8th June 2016, the 10 delegates present took turns to express how they and their group members feel toward the hand of fellowship extended to the pig cooperative by our Japanese supporters through our brother, son and friend Go Komatsu. A member stood up and enumerated some of the projects that our Japanese supporters have assisted to make our dream come true, like the windows, door shutter of the pig cooperative building in Bawock, pig fence infrastructure project, Community training of pig farmers in Batibo sub-division and above all the assistance for office documentation, phone and internet communication which has gone a long way to keep our supporter and the public well-informed about our activities. Another group delegate said, "I have sold some of my pigs, the stock given to me by the Dutch girl and paid my child's school fees, thanks to the fact that our Japanese friends supported me with a good infrastructure that confined the pig ". 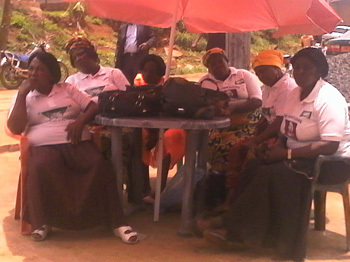 "With all of the above assistance given within a very short time of acquaintance, WE HAVE ALL GATHEREED HERE TODAY TO SAY THANK YOU, TO ALL OUR SUPPORTERS for standing by us in time of difficulty and it is our wish that this healthy relationship continuous for as many years as possible, God almighty being our helper". We regret to inform you that one of our biggest challenges within the pig farming sector is the African Swine Fever (ASF) disease attack which is quite endemic in our area such that each year;- May, June, July, August, we experience a great set-back. We are therefore soliciting for your prayers, advice and continuous support in the areas of bio-security and community trainings so that we can be better equipped to face our major challenges. On a conclusive note, with reference to the bible book of Titus 2; 1-4, the project coordinator said, group delegates as adults, should strive for perfection in their attitude Or be exemplary in everything they do in life within their different communities such that the younger generation should be able to learn from their examples. 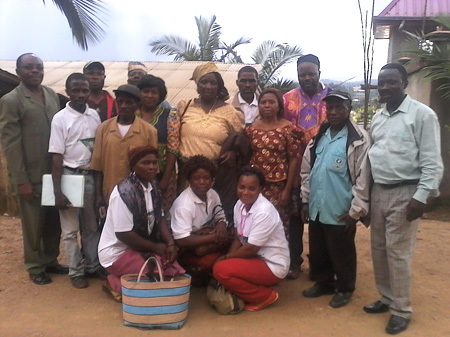 "Today we look back on your works and say THANKS - ARIGATO, We will Pray for you Always"
Passing on the message from supporters to the listening ears of beneficiaries on the occasion of Passing On the Gift (POG) in Batibo.